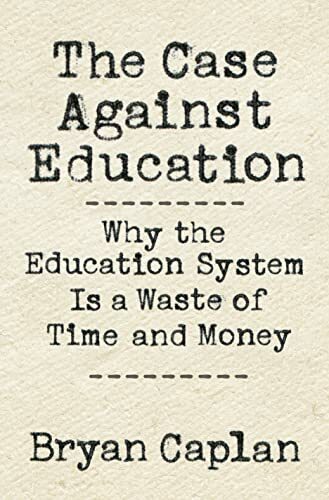 In this book, Bryan Caplan succeeds, at the very least, to make a case to support a reasonable doubt about the effectiveness of providing a University education to the masses. Caplan himself is a University professor of economics by trade, and thus his arguments for rejecting the usefulness of a university education is based within the realm of economics and statistics – though he does attempt to capture elements outside of these realms within his scope of expertise (with varying degrees of success) in order to give a more complete picture of this problem of education. Caplan was kind enough to state this at the end of his book: "My thesis, in a single sentence: civilized societies revolve around education now, but there is a better – indeed more civilized – way." (289) Of course, there is a little more to it than that – so we will get into those points now. Let us begin with the personal biases that will get one to cast doubts on the conclusions in this book (especially when we are dealing with statistics, biases are very important to recognize) – for one Caplan may claim that he is moving in the direction opposite to self-interest. Universities require an ever expanding student base to pay for their army of professors and administrators. If you reduce the number of students (or cut government funding), you hurt your source of income. Since Caplan is a university professor, he is putting his own career in danger. Also, this proposal would do little to gain friends within the academic community if you are threatening to put their livelihood in jeopardy as well. Since Caplan is a member of a community of academics, this would hurt his standings amongst his peers if he suggested that his profession is largely useless. That being said, Caplan is amongst the best in his field – so if his recommendations are implemented, this would result in far less economics PhDs being minted, therefore making his position as an economics professor far more valuable. He is comfortable enough in his status and position that he largely does not need approval of other professors to remain relevant, and he is in demand enough to not worry about finding another job if most universities close down from lack of enrolment. Caplan's suggestions would greatly help persons such as I, a fairly newly minted PhD. If the system suddenly halted producing PhDs for many years to come (maybe not short term benefit, but certainly in the long term as it would as older professors retire or move on). I believe his biases for writing this book are more in favor of his self-interest, but there is enough negative blowback possible from this to say it not egregious. Caplan's arguments are based largely on general statistics, which makes sense considering his observations cover the general trends of Western society as a whole (to be more accurate – on the United States specifically, however this general trend can be transposed onto other Western nations more or less equally). Caplan argues that some problems are simply better off left alone, as attempts to fix issues may indeed cause worse problems to surface. Education would be a good example of this – we originally thought that all the masses needed was an education for all the problems associated ignorance, of which there are many, to be solved. Unfortunately, as it turns out, all the education in the world cannot fix human behavior in a group setting. One may be pensive and thoughtful when alone writing a paper, but put into the center of a violent mob, one acts quite differently. Caplan cites statistics on basic literacy and knowledge of what was taught in schools to grown adults (several years after graduating), and shown that mental atrophy is indeed a real thing. The percentage of what we were taught versus what we will use in our day to day lives is generally assumed to be 20% useful and 80% useless. Does this mean that the students are failures to absorb and utilize what the system was teaching them, or is this a failure of the system to teach students pertinent information? It is possible that the Enlightenment movement gave the common person too much credit. If given a chance to learn about the wonders of the world, few would care to take advantage of it. Beyond eating, sleeping and fornicating, there is little else the masses are interested in. Indeed, a small minority would revel in the opportunity to learn about the world, but this is such a small percentage to not justify the cost of educating all. What people do care about is the status of obtaining a degree, and only so far as how this status can improve one's odds of eating, sleeping, and fornicating. Caplan does show us just how much abundance we have in our society, and just how redundant so many us are. In hunter-gatherer societies that enjoy an abundance of food, there is enough to go around to encourage others to pursue the arts or spiritual lives. In Western society, we have so much abundance in our world today that we all can easily spend a third of our lives and a good percentage of our GDP to learn useless information that we really do not care about. The point then, is that we have become ideological slaves to the idol of education, even if worshipping it is pointless and produces nothing for society. A weak argument used by Caplan in this respect is the idea that some knowledge can be seen as garbage because of the interconnectedness of the world at large. Our ability to observe the world and relate it to something we know cannot be so easily dismissed as useful or not, just like the purchase of insurance. Indeed, if we purchase insurance and never put in a claim, then we can say the money spent on insurance was a waste of money. The problem arises if we need insurance and do not have it – the same can be said for education. It is a little late after the fact, like learning to defend yourself from a mugger after you have already had your wallet stolen and are lying on the street bleeding. This book is very easily read, and seems to be geared towards as large an audience as possible (for good reason, as those who are largely uneducated in universities as of yet would benefit the most from its lessons). That is good and bad – the good is that it is easily understood, the bad is that it leaves us open to incorrect generalizations and manipulation. His grasp of some human psychology is incomplete or wrong (especially when it comes to lying), but in a general sense he gets the right message across. Caplan makes some interesting observations on education, and it certainly makes it appear to be nothing but mental exercise. He shows that IQ can increase temporarily with education, but one's baseline IQ will return after a period of inactivity. Caplan is correct to make light of the problem of academic inflation – that once what a high school education would be sufficient to get you a job now requires you to have a Bachelor's. The responsibilities of classic jobs have not changed so much over the years, only the extra time wasted sitting in a classroom in order to do it. As a status symbol, education is seen as valuable for the individual and the hiring company – it shows that we are intelligent, conscientious and can conform to group standards. Indeed, companies need some method to differentiate poor candidates from good ones, and a resume tells us little about the individual and whether or not they would make a good fit for the company. What education does is tell a potential employer that one is intelligent and submissive to social norms, which is more than enough to satisfy an employer. The more education one has, the more submissive and intelligent one ought to be. Where this academic inflation will go in the future is two possibilities, either we hit hyperinflation and everyone will need a PhD to sweep a floor, or deflation will happen (like what Caplan would like) and we return to a historically acceptable level of education obtainment that reflects the needs of society. Some good news in this book is proving that the heavily politicized education will have an opposite effect on the younger generation (what was once traditional produced harder leftists, and now harder leftists will produce harder right-wing adults), and that most of what makes us is our genetics, not schooling. How is this good news? Because the flaws of the system will not translate into flaws of the person (and a collapse of the system will not result in the collapse of mankind). All in all, this is book succeeds in what it sets out to claim – that a highly educated general population is not as beneficial to society as we once thought. It forces us to rethink what we already feel – a hyperreal situation where we know that a university education is largely a waste of time and money, but we continue to pretend this is not the case. If we look at the two paths set out in front of us – academic inflation or deflation, I hope Caplan's suggestions are implemented as this could save us countless years and money being thrown away for nothing.